No surprise.... here.. I was long expecting something like this to happen. How can two parties with entirely different ideologies form a coalition government? Especially at a time when people are furious about the double taxation (Income tax in Germany is among the highest in the world, on top of that people have to pay EU Tax also). Some marriages are made in heaven. But Germany's "grand coalition" was a marriage born of the ballot box. So what do you think the future will be? Elections? or another dirty coalition from CDU with any of the smaller parties? 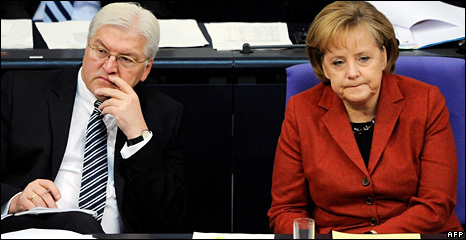 I think if elections happens now CDU will retain most of its votes while SPD will suffer a beatdown, as people are not happy with their left wing policies. If they can't work together then they should resign. Coalition politics will always be like that.. unstable.. Let them call the new elections..